Download "Curriculum & Courses. I. General Foundations (all courses required) II. Content Area Foundations (select one course from 4 out of 5 areas)"
1 Curriculum & Courses The department of psychology offers a major and a minor in psychology. Both of these are designed to expose students to the various branches of psychology (e.g. developmental, social, cognitive, physiological, and individual differences) while allowing them to focus in on one or more of these branches according to their interests. Additionally, both the major and minor requirements incorporate a research methods component, which is essential to the study of psychology. 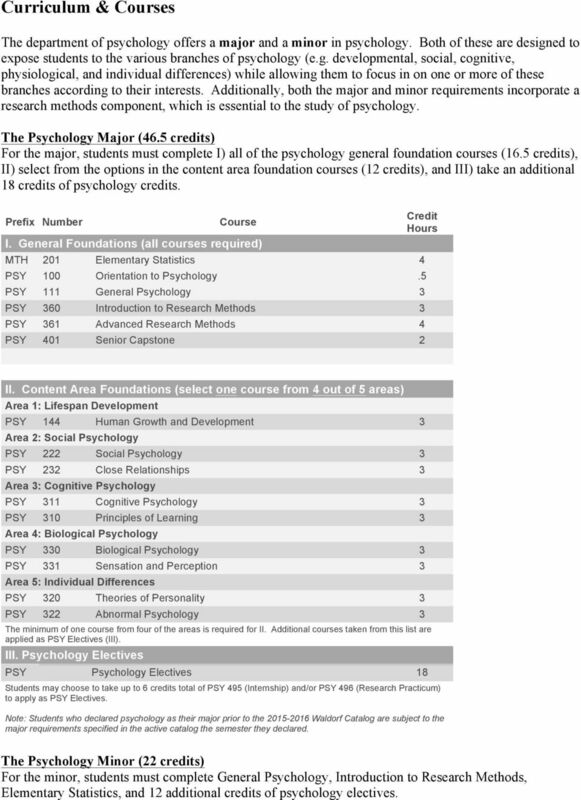 The Psychology Major (46.5 credits) For the major, students must complete I) all of the psychology general foundation courses (16.5 credits), II) select from the options in the content area foundation courses (12 credits), and III) take an additional 18 credits of psychology credits. Prefix Number Course I. General Foundations (all courses required) MTH 201 Elementary Statistics 4 Credit Hours PSY 100 Orientation to Psychology.5 PSY 111 General Psychology 3 PSY 360 Introduction to Research Methods 3 PSY 361 Advanced Research Methods 4 PSY 401 Senior Capstone 2 II. Content Area Foundations (select one course from 4 out of 5 areas) Area 1: Lifespan Development PSY 144 Human Growth and Development 3 Area 2: Social Psychology PSY 222 Social Psychology 3 PSY 232 Close Relationships 3 Area 3: Cognitive Psychology PSY 311 Cognitive Psychology 3 PSY 310 Principles of Learning 3 Area 4: Biological Psychology PSY 330 Biological Psychology 3 PSY 331 Sensation and Perception 3 Area 5: Individual Differences PSY 320 Theories of Personality 3 PSY 322 Abnormal Psychology 3 The minimum of one course from four of the areas is required for II. Additional courses taken from this list are applied as PSY Electives (III). III. Psychology Electives PSY Psychology Electives 18 Students may choose to take up to 6 credits total of PSY 495 (Internship) and/or PSY 496 (Research Practicum) to apply as PSY Electives. 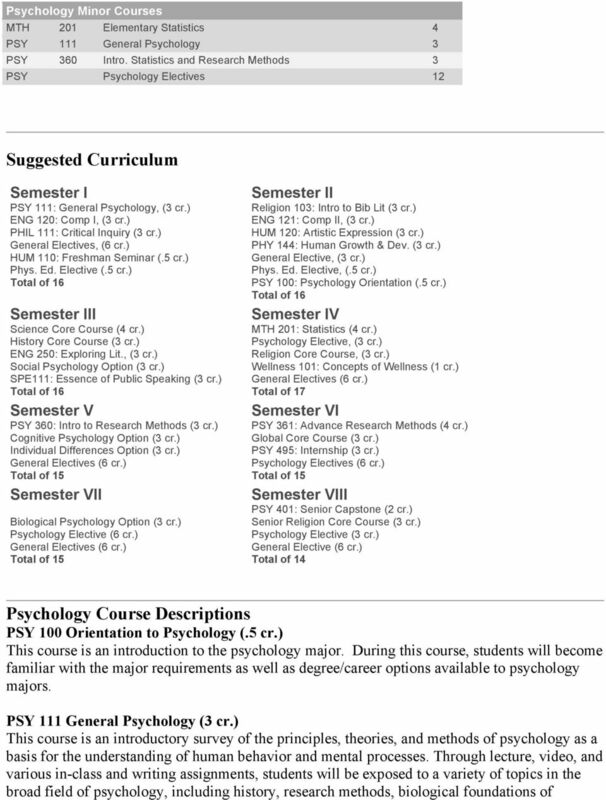 Note: Students who declared psychology as their major prior to the Waldorf Catalog are subject to the major requirements specified in the active catalog the semester they declared. The Psychology Minor (22 credits) For the minor, students must complete General Psychology, Introduction to Research Methods, Elementary Statistics, and 12 additional credits of psychology electives. 5 PSY 361 Advanced Research Methods (4 cr.) PSY 361 builds on much of what students learned in PSY 360. In this class the research process will be considered from start to finish. Students will get research experience by completing a research project over the course of the semester. Students will collaborate to design a study, collect and analyze the data, and write a research paper about their project. (Prerequisites: PSY 360) PSY 400 Special Topics in Psychology (3 cr.) This course will examine a specific topic in psychology. Historical and contemporary theories and research about the topic will be discussed in depth. The topics will vary and are determined by the instructor. PSY 401 Senior Capstone Seminar (2 cr.) This capstone course will allow students the opportunity to examine current psychology issues by building on the content they have learned as psychology majors.. The course will assist students in culminating their educational experience by completing an independent research proposal while also exploring original sources of the content they have learned in previous classes. 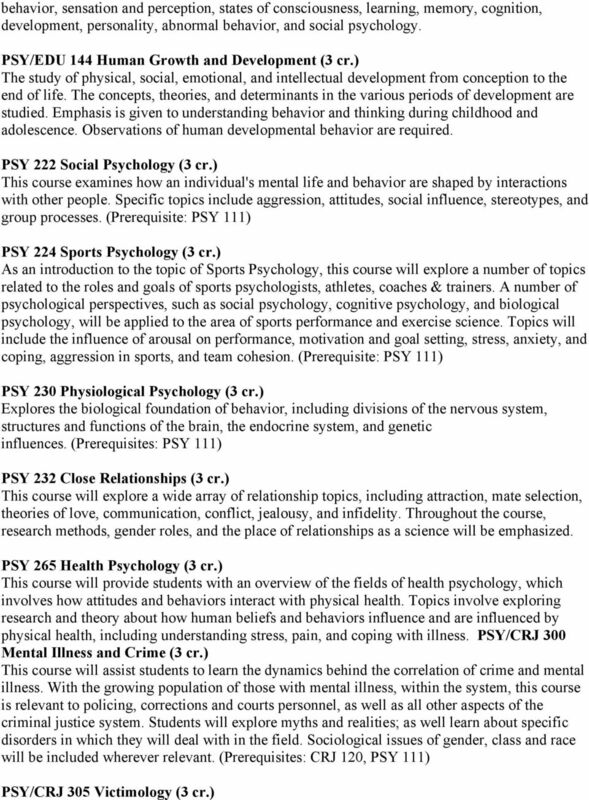 (Prerequisite: Senior psychology major or permission of instructor) PSY 422 Counseling Theories and Techniques (3 cr.) This class is intended to prepare students who seek to enter a counseling-related career. The main theoretical perspectives of counseling will be addressed. In addition, an emphasis will be placed on maintaining confidentiality, avoiding dual relationships, and navigating power issues. A variety of instructional approaches, including student role plays, will be used to achieve the course goals. (Prerequisite: PSY 322) PSY 495 Internship On-the-job learning in an applied setting such as a mental health center, psychiatric unit, residential treatment center, human resources office, or laboratory setting. Supervised by on-site facilitator as well as faculty member. A minimum of 25 clock hours of supervised work is required for each hour of credit. PSY 496 Research Practicum Students will work with a psychology faculty member to gain experience conducting research in a laboratory environment. Responsibilities will vary depending on the project, but may include designing and conducting experiments, creating stimuli, coding and analyzing data, literature searches, and written reports of experimental findings. A minimum of 25 clock hours of supervised work is required for each hour of credit. PSYCHOLOGY. PSY 0004 PSYCHOLOGY CAREER PLANNING SEMINAR 1 cr. PSY 0010 INTRODUCTION TO PSYCHOLOGY 3 cr. PSY 0022 INTRODUCTION TO EXISTENTIALISM 3 cr. 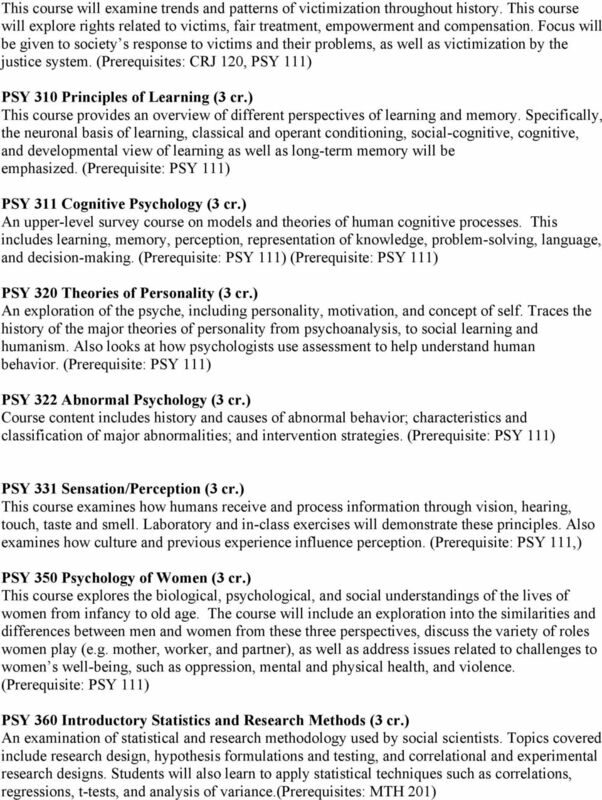 Psychology 161 C. Applications of Psychology Choose 8 credits from the following courses: PSY 4110. 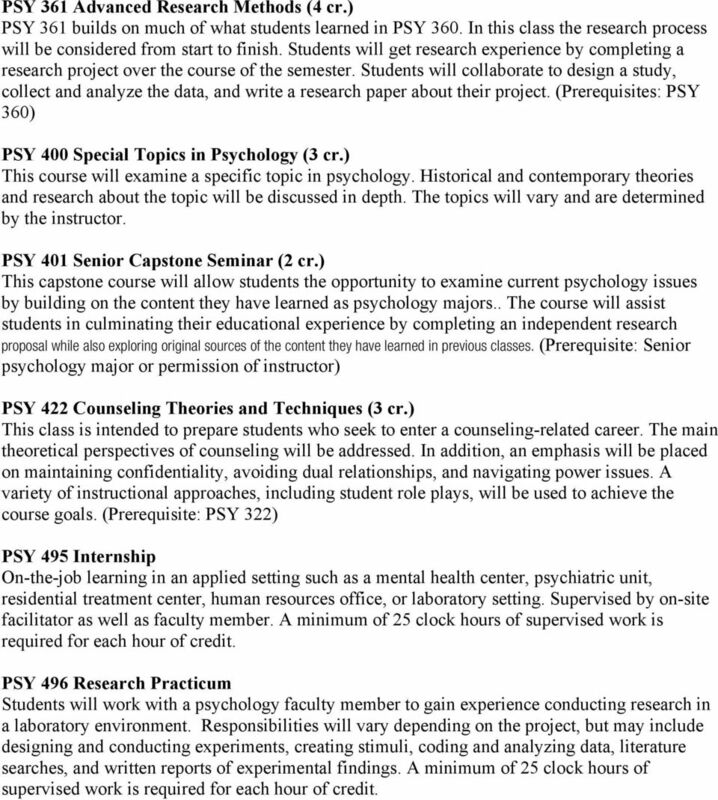 Undergraduate Research (no more than 4 credits will count toward the Psychology major) PSY 4120-4130. PSYC PSYCHOLOGY PSYC1003 is a prerequisite for PSYC1004 and PSYC1004 is a prerequisite for all remaining Psychology courses. Note: See beginning of Section F for abbreviations, course numbers and coding. Faculty. 1 Completed with ASI 110 and ASI 120. 2 Or ENG 100A and ENG 100B, or ENG 200H, by placement. 3 Completed with ENG 200H or ASI 120. Forensic Psychology by Pozzulo, Bennell, & Forth. KNHS - Kinesiology and Health Science Courses KNHS 2100 Diet and Nutrition (2-0-2) A study of the relationship that exists between diet and nutrition with specific application to maximizing overall health.